The locomotives in the beginning formed the quaintest assortment that ever adorned a railway of this length. This collection had been gathered together through the united efforts of the directors and officials of the Lynn and Fakenham and the Yarmouth and North Norfolk Railways. It has been commented that the overall effect was that of them being "purchased at a jumble sale". Exception must be made of four fast passenger engines which started work on the Lynn and Fakenham Railway about 12 months before the amalgamated lines became the Eastern and Midlands Railway. 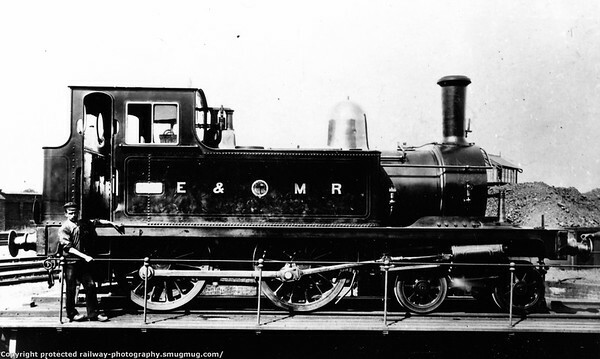 The passenger locomotive stock consisted of seven small 4-4-0 side-tank engines built by Hudswell, Clarke & Co., of Leeds, between 1878 and 1881. In spite of their small size they were well-built, excellent little engines. They worked passenger trains between Lynn and Fakenham, sometimes running two double trips per day between Yarmouth and North Walsham. Towards the end of the century, when the railway was the joint property of the Midland and Great Northern, these little engines worked branch passenger trains at Lynn, on the Bourne and Spalding section, where Nos. 19 and 20 were generally to be seen, and the Mundesley-on-Sea branch, which for a long time was worked by No.9. The other four engines of this class bore Eastern and Midlands Nos. 8, 10, 40 and 41.